Hello all you Daily Photo viewers from around the world. I'm glad you stopped by on theme day, one of my personal favorite theme days we've had. I will be stopping by your blog later to see your 'night' photo first hand. The photo I've selected for theme day comes from my garage as I look out between my two parked vehicles in my driveway. On this particular evening, there was a fantastic lightning show on display. I was in the process of snapping several outstanding lightning shots when the rains poured from the sky. When I say poor, I really should be saying buckets of rain were falling. I retreated to the quickest dry location I could get too, my garage. Since I was still setup for photo taking with my tripod, I decided to take a few more shots from the safety of my garage. Honestly, I was just experimenting with some techniques, but when I looked at the photos on my computer monitor, I really liked what I saw from these shots. It has become one of my most commented on photo on here and off of the blog. I had to repost it once more for today's theme day photo. Was really looking forward to your photograph today. Your night photography is so good and this is superb. 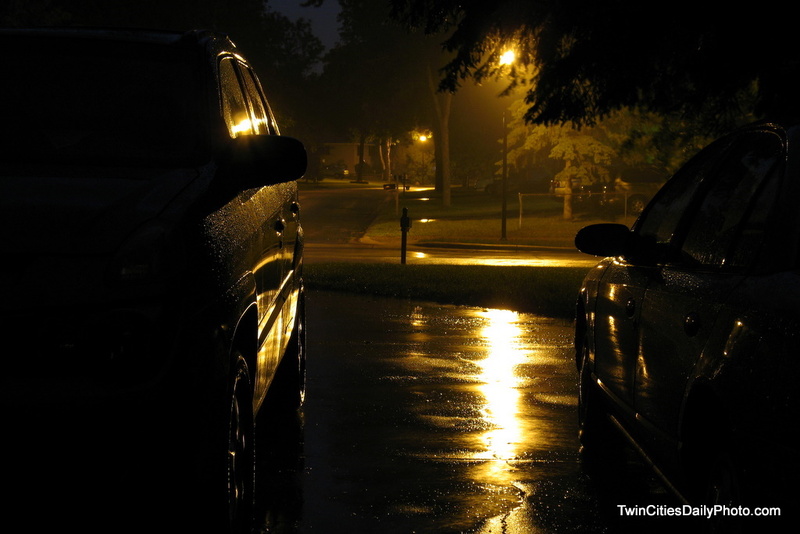 That rainy, mistiness under the trees and then the reflection of light on the road and the cars is just beautiful. I find night photography v difficult so unlike you, it wasn't my favourite theme. I well understand it is yours. Oh, this is soooo nighty! I'm with Jilly, great use of nightlight to create an atmosphere. You are absolutely right, no need to go very far from home to get great shots! Fabulous shot. It wasn't my favourite theme either, mainly because I don't have the right equipment. This is so atmospheric. it's lovely and very " golden " It's always fun to see what others come up with...and you never disappoint. It looks like the view from Garden. Beatiful rain drop, it looks wet. Great photo as always .. moisture adds to night time reflections .. I also find this my favorite theme day to date. Glad to have discovered your blog, your Theme Day photo is really special and it's quite incredible you did this from your garage. Really a great shot! I like this image very much. It is so simple and yet you have captured a wonderful atmosphere. I must keep in mind that shots do not have to be taken very far from home to be fascinating. Your night photos has brought back a lot of childhood memories. It reminds me of long ago when the rains pounded on our tin roof. Rainy nights leave me with a chill and always have and I used to like to snuggle under the down filled quilt and listen to the rain pounding on the tin roof not that far above my head. World War II was exciting as the old search light would shine into my bedroom all the way from near where I live today. About 7 miles or more less the way the crow flies. I would lay there and listen to the rain on the tin roof and I would wonder if the Germans or the Japs would be following the search light right into my bedroom. I had a lot of chills. Now, you and your friends can help me Make History. I am trying to see if it is possible to get 10,000 visitors in a short period of time on my new blog, Pick a Peck of Pixels. If you go there, please either become a Follower or leave a comment. You can come back each day to see and read something new. Your visit will count and help me Make History. Great shot! moovie one really. I love it, it has mood! This is a beautiful photo. It makes me want to put on a sweater and curl up with a good book - just like a rainy night would. Very nice. Sometimes pictures just present themselves . . . you just have to always be open to the unexpected and you were open and ready for this one. It's like a magic of light. I love this graphically and technically. You must be doing something right...your street is golden!! That is really a spectacular night photo! The light is beautiful. I ended up posting a Theme Day picture I took in my front yard as an afterthought and it turned out to be one of my most commented on pictures too. Very moody scene. Nicely done. Are you ever going to join us for a photo walk again? Great composition and the light and mood is perfect! Greetings from MC.